Chelmsford’s Glenn Davison, 52, says kites are fun and require “serious science” to make them aerodynamic. Glenn Davison, 52, a former software trainer from Chelmsford, is retired. That leaves more time for an avocation he’s enjoyed since he was 8 — flying kites. “I’ve always liked everything that flies,” said Davison. “I built 21 model rockets, and a few model airplanes as well. I used to buy plastic kites at the drug store, and fly them across the street with my dad. Flying kites has held Davison’s imagination for more than four decades. Gary Quinton, a computer support expert from Lynn who declined to give his age, said he welcomes those recent advances. 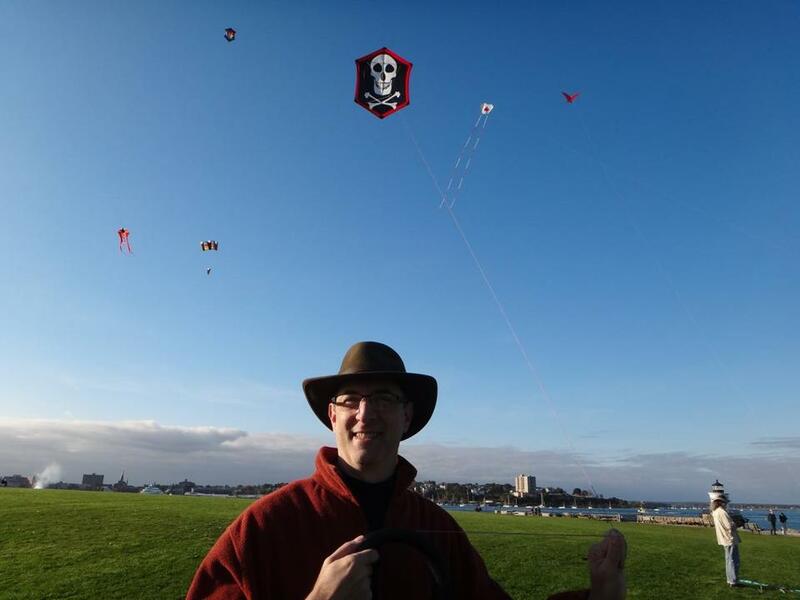 A stunt kite gave Archie Stewart a new lease on life. Stewart and Davison keep current with new kiting developments through workshops they host throughout Massachusetts. Davison’s workshops have literally taken him around the country and world, including a class with 200 children in Taiwan. Erin Gannon, an art instructor at Excel Academy in East Boston, invited Davison to teach the finer points of kite building. “I was interested in kite making with my students because it was an opportunity for them to combine art, engineering, and getting outside,” said Gannon. “I had 20 kids who chose to spend the spring making and flying kites. “I think kites are beautiful. And I was looking for an activity we could do on Constitution Beach,” she said. That beach, in Eastie’s Orient Heights, is one of many great area locations to fly kites. Davison lists others on the Kites Over New England website, including Castle Island and Pleasure Bay in South Boston, Good Harbor Beach in Gloucester, Nahant Beach, Millennium Park in West Roxbury, Danehy Park at Fresh Pond in Cambridge, Malibu Beach in Dorchester, Squantum Point Park in Quincy, Nantasket Beach in Hull, Revere Beach, Salisbury Beach, and Sagamore Beach on the Cape Cod Canal . The variety of kites and locations matches the variety of people drawn to kite flying, said Quinton. There are also a number of misconceptions about flying kites. Davison said he prefers a hands-on approach to educate. “I try to dispel those misconceptions by giving others the chance to try the kite I’m flying,” he said. “I was in Canada at a festival this summer, and during the Night Fly, my kite had lights on it and lights on the line. One by one, I passed my kite line to about 500 people so they could enjoy the feeling of flying a kite steadily on a warm summer breeze. If you have an idea for the Globe’s “On the Move” column, contact correspondent Brion O’Connor at brionoc@verizon.net.